~~Total seclusion on over 18 lush acres with roaring waterfall and long creek frontage~~ A true mountain escape property--no other homes in sight! 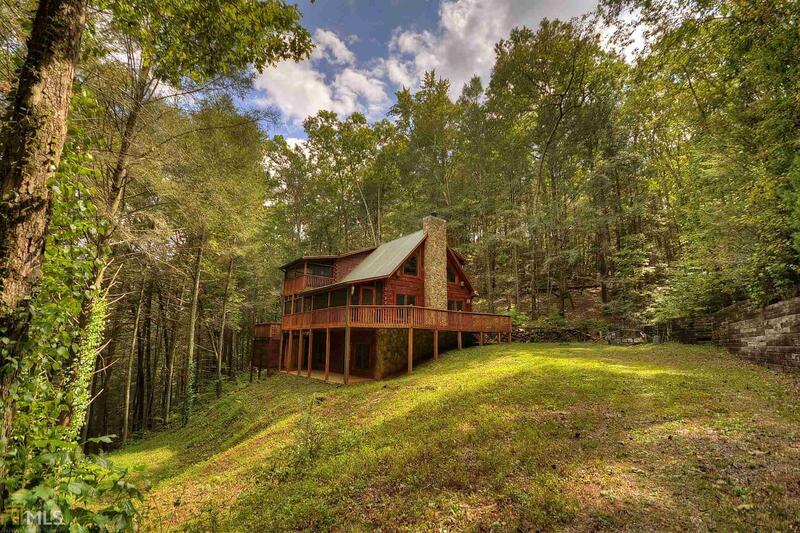 This solid log constructed cabin sits above the rushing rapids of Ross Creek nestled moments from downtown Ellijay. Perfect vacation property to get away from it all! All wood interior with open layout, oversized loft, lodge style great room with central fireplace, chef&apos;s upgraded kitchen with granite and butcher top counter, master retreat with rooftop deck. Full unfinished basement offers future space for 3rd bedroom suite and entertainment/media room. Excellent property for vacation rental program. Multiple building and camping sites on the property. Sold mostly furnished. Directions: From Ellijay Courthouse, Take Hwy 52 West For .5 Mile To Right On Boardtown Rd. Go 2.3 Miles To Left On Old Flat Branch Rd. Go 2.5 Miles To Right On Scott Hollow. Left At Top Of Hill On Flagpole. Go 2.5 Miles To Left On Old Chopped Oak Rd (Gravel).